One of the fortunate folks attending the Kumbaya Konference at Homestead today (live streaming at 12:25pm ET courtesy of IndyCar.com) was kind enough to forward, well, THIS. Excuse me, my eyeballs just fell onto my desk. UPDATE: Oh, what the heck. With all of the news going on today it's probably best to just keep it all in this post. Is It May Yet? has found this photo of Vitor's new co-sponsor and livery. Try to act shocked when they reveal this later today. IndyStar says there will be NO schedule announcements today. Bummer. TrackSide Online notes that although Buddy Rice is still not officially announced for D&R, a trailer has officially shown up with cars for both Mr Rice and Ms Duno. LIVE:...and we're waiting for the video feed to magically appear at IndyCar.com. Without a doubt, the most anticipated press conference since OJ Simpson was first taken into custody. 12:18 It's up. Lovely faux palm trees by the podium. 12:30 Nothing yet, and all I see is the podium to the right. Is it wrong to have expected a huge table where a symbolic signing could take place? You know, with big feather pens? 12:31 We're starting, and now it's just a photo op with Mr George and Mr Kalkhoven shaking hands in front of a whole lotta drivers. 12:32 OK, everybody sit down...a-ha, a table! 12:33 TG: "We are going to unify." I think he just said THEY called HIM. 12:36 KK starts off by coughing into his hand. Nice. 12:38 Anyone keeping track on the number of times these guys are using the word "potential"? 12:40 We are told Robert DUNE-boss (err, Dornboos) is in the house. 12:43 TG confirms Long Beach will be "the Champ Car finale", and Edmonton and Surfer's Paradise should be on the schedule this year. At Long Beach teams WILL be using the DP01s, and afterwards they will hold a demolition derby outside of West Coast Choppers...OK, I made the last part up. 12:46 Teams will be partering to help get up to speed (literally). NHL will team with RLR (Hi, Graham!) and PKV will be working with Ganassi. 12:48 KK coughs some more, hopes Champ Car Fan(atics) can be "amicable". At least the ones not yet in paper suits. 12:49 Robin wants to know who gets new cars and who gets used cars. He's obviously thinking of opening a Dallara dealership. 12:51 KK just hinted that "we might see a couple of drivers come back from Motegi and jumping in a DP01". Hey, if they get points for both events, why not? 12:52 I'm not within sniper range so I can safely say Brian Barnhart should seriously consider dialing down the blow dryer. 12:55 TG: "...our offseason is way too long." Amen, brother. AMEN! 12:57 Cavin asked "Was it worth it?" Not exactly a definitive response as KK said he didn't want to look back and TG said "Can I use his answer?" Many chuckles. 12:58 Uh-oh. Mr George says “I think we’ve pretty much exhausted our opportunities for ovals”. Anticipates a 20 race schedule, half being ovals. 1:00 TG: It's about the fans...bring everyone together...happy fans. 1:01 Oreo asked about TV ratings. He works for ESPN, ya know. 1:03 KK: Atlantics will continue with a 12 race schedule. Cosworth has non-racing related revenues so it's all good. 1:05 I couldn't hear very well but I think someone just asked if KK has any interest beyond being an owner. TG (not KK) stumbled through a non-response about "leadership". 1:08 TG is high on adding Toronto in the future but as for Montreal "...uhhh, I don't have an idea as to what the commitment is there." 1:11 For sheer entertainment purposes this shindig should have included Derek Daly. 1:14 Barnhart says Dallara will produce 14 new chassis by May. You can purchase them at Robin Miller Dallara of Greater Indianapolis. 1:16 ...and that's a wrap! Let's get some cars on the track now. Ooh, ooh! Here's one! What'll be the funniest reunification moment? 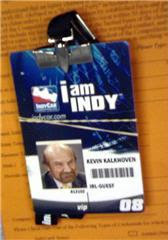 I don't mean giggly funny, like a full, talented field at Indy. I mean funny like Kalkoven's ID card. For me, it'd be Vasser running and winning Indy, and taking a swig of milk, having asked in '96, "Who needs milk?" Okay, but Jimmy Vasser winning Indy would be funny in many more, incredible, unbelieveable, struck-by-lightning, how-the-hell-did-that-happen kind of ways. True, but I want to see the smug son of a gun with a milk mustache. That said, I like Jimmy - think he's a great driver. He just got caught up in a political fireball, and annoyed the heck out of me. Buddy Lazier winning with an all-but-broken back is up near the top of my Indy memory list, if not at the very top. I still haven't decided: class or press conference. Class or press conference? The class is Economics of Sports, which is the only reason this is even a choice. Can you take notes on a lap top, while watching the press conference? That's what I'd do, but I have a BS swimming class. I don't have a laptop. Ah, the hell with it, we've waited 12+ years for this. See you all in 40 minutes! Yeah, I'll take the over, Dale. Also, note the name change, from site user name to real name. Sorry Eric, but you are only allowed to use the name "John" at this site. at least CCWS gets their Long Beach send-off. Crappies, get over it already. Jeebus, KK. Someone get the man a Ricola. LOL first question comes from Robin Miller. Can't believe Cavin had the balls to ask that now. I logged off because I was sick of the horrible sound of KK coughing up a lung. He asked them the "was it worth it" question. Both sidestepped it. Too early to tell if it was worth it. Duh, Cavin. I think Cavin meant the last few years. Thus, they both said time to look forward, not backward. Just think. In a few hours, we'll have test results. My favorite moment was TG asking if he could use KK's answer. KK hopes Champ Car Fan(atics) can be "amicable". At least the ones not yet in paper suits. Over? ,,,,,,,,, Did you ,,,,, say "over"? ,,,,,,, Nothing is ,,,,, over ,,,,, until WE decide ,,,,,, it is! Was it ,,,,,, over when ,,,,,, FTG bombed Pearl Harbor ?!?!?!?! The sound guy is against the merger ! The biggest thing that just went over everyone's head was when Kevin said some drivers may come back from Motegi and run Long Beach ... follow-up please did you really measn that ? "The German's bombed Pearl Harbor?" Jeff, thanks for the updates. I'll watch it on TiVo when I get home. Man, I can't WAIT until they're actually, you know, racing. Someone call the cops on paper the crappie fan for comma abuse, please. kthxbai! Kidding, of course. The picture ID is classic. I'll watch it later when I hit the hizzy. One question that may have been answered on the telcon: Indycar.com reported the name change to KV racing. Any scoop on that? p.s. Bussy Rice now officially added to testing list. That puts us at 17 cars testing. I'll admit, I'm glad the Atlantics are staying for one reason: more Frankie Muniz! Apparently he hooked on to PCM's team. You KNOW it's big when highlights of the meeting were on ESPN's SportsCenter this AM.